Goooodmorning Queens! After a great first night sleep in The Paper Factory Hotel on the 36 str in Long Island City I could not wait to go explore the area. Got my running gear together, put a $20 dollar just-in-case-note in my pocket and quietly went outside with no particular place to go. That happens pretty often in my life and so far it has turned out pretty good. But after a couple of left and right turns I felt like I needed a destination and I decided to head for the East River and run along it until the Ferry stop. Almost 2 hours later I returned. 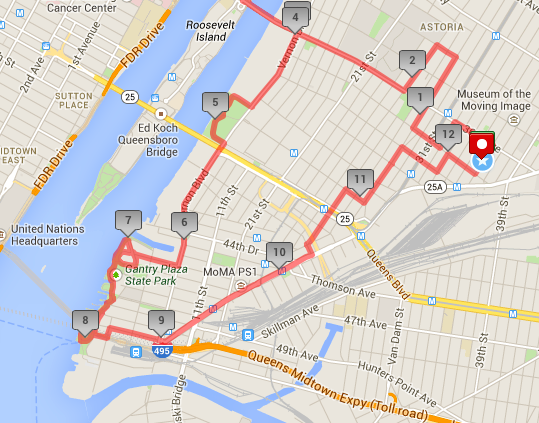 Without the 50 some pictures I had taken along the way – they had somehow gotten lost in the Runkeeper app. Bummer. But I can still picture clearly what I had seen and where I had gone up, over, under, in and passed: Roosevelt Island Bridge, the does-it-never-stop-going-uphill-Queensboro Bridge (the bridge that killed me during the 2011 marathon), Queensbridge Park, Gantry State Park, East River and Manhattan Skyline, Chrysler Building, Empire State, the neon Pepsi Cola sign, The Long Island Gantry signs. Towards the Ferry stop, I ran into a filmcrew who were filming for a new series. Watched the East River Ferry come in and turned around to go back to the hotel. Discovered all kinds of nice little places to go back to. It was a 7.5 miles/12K run. My longest 12K ever. A true treat! My personal favorite is the Paper Factory Hotel. It is right across from a subway stop and the design is totally awesome. But our stay at the Z NYC Hotel was pretty good also. All the rooms there have a great view on the Manhattan skyline and they offer a shuttleservice into town. 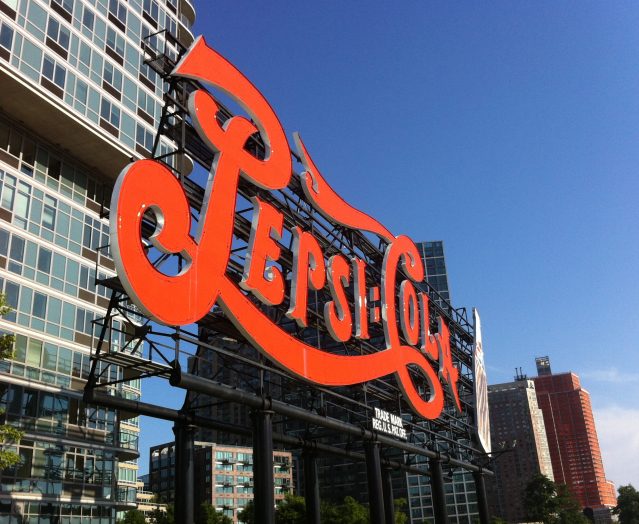 Staying in Queens is cheaper than in Manhattan and Brooklyn. You're a little further away from where the action is, but Queens is upcoming and rapidly developing. 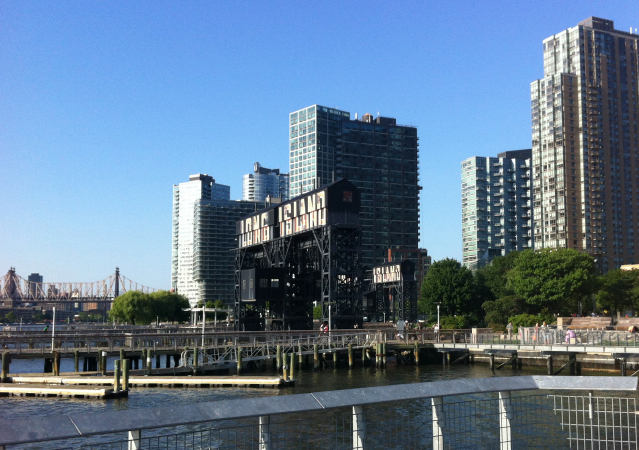 Click here for an overview of all hotels in Long Island City. The MoMA PS1 museum and M.Wells Dinette. The cosy bar, the beers and the food at the Dutch Kills Centraal Gastropub. The coffee and breakfast at Sweetleaf. The drinks with a view over the East River and the Manhattan Skyline from the Anable Basin Bar. Where we ended up after we had spent the day biking through Queens. Which is also very fun to do. We started with a bikeride across Roosevelt Island and then went to Astoria Park where we saw this awesome old ancient outdoor swimming pool (not yet ready for summer). It looked like a wonderfull place to spend a warm New York City day. Along the way we stopped at the Socrates Sculpture Park and on our way back to Hunter's Point - going left and right here and there and through Astoria - we ended up at Anable Basin Bar. A perfect day in Queens!